I’ve put together this free meal plan to give you an idea of what you may be eating as you clean up your diet. My goal was to give you enough nutrition and to have you eat regularly (every 3 hours or so), such that your blood sugar will be steady and not going up and down due to long periods without eating or sugar spikes. I’ve included nutrition counts for you. The meals for week one are approximately 1650-1725 calories. I’m making the assumption that you are working out, doing at least 4 days a week of intense exercise, so there needs to be enough nutrition to support that. Too many calories? Remove a snack or replace a meal with other recipe. Please note the portion sizes for each recipe so that you don’t overeat. Save leftovers for later in the week as noted or share with family. If you see something that you don’t eat, like bread or dairy, switch for something else. A few romaine leaves are a great substitute for bread or whole wheat tortillas. This plan is meant to work for most people, but I know it’s not ideal for all. Modify to your needs! Cook penne according to package directions, adding green beans during last 4 to 5 minutes of cooking. Drain; rinse under cold running water. Drain. Meanwhile, mash garlic and salt with back of fork or side of chef’s knife into a paste; place in large bowl. Whisk in vinegar and oil. Add penne, green beans and all remaining ingredients; toss to coat well. We are providing these meal plans for your personal use only. Do not distribute or use these plans commercially. Disclaimer: Nutritional content will vary depending on the brands of food used. This meal plan does not take into account serious illness or specific nutrient ratios. If you are pregnant, have high blood pressure, heart disease diabetes or other medical issues, please talk with your doctor or dietitian/nutritionist before changing your diet significantly. These plans are meant to be examples of balanced eating, but we all have varied needs. Use this information as an example and take caution with regard to your own specific nutrition needs. Love this meal plan, but I do not eat oatmeal, yogurt or cheese, is there a substitute you can recommend? For oatmeal I suggest whole wheat toast or whole wheat cereal. Yogurt…select another snack with protein. Cheese, you can switch that for fruit. You can modify the plan and switch with something else. Is there a way I can change these meals into a 1200 caloric intake? I agree with Lina, Is there a way the calories intake can be 1200 a day? Hi Ladies, I never suggest super low calorie plans for people who exercise. In the end people never intend to keep eating 1200-1300 calories for the rest of their lives. They may lose weight with low calorie plans…but they gain all the weight back when they stop “dieting”. I would also suggest that you check out the vegetarian plan and just add some meat to it. That might be a better fit calorie wise. All in all you can also remove the snacks to reduce some of the calories on this plan, but they are their so that you don’t get hungry between meals. Check out http://www.eatthismuch.com as well for other free plans. This is AMAZING. Thanks SO MUCH for doing this!!! Hi Latrice, I’m not able to do one on one coaching until the new year so I all I can offer right now if advice. The 2 things you need are a plan and a commitment. I suggest that you speak with your doctor and a nutritionist about what ways of eating my work for you with your health issues and your goals. Low-carb eating, clean eating, going vegan…There are so many plans that could work…but you have to find the right plan for you and that can be hard. That is why working with a licensed expert may be the best routine for you. Other than that, I suggest you read “The Eat Clean Diet” or check out my clean eating ebook for info on cleaning up your diet. Add to your eating plan exercise 4-5 days a week. Walking and workout DVDs at home are a great way to start. I love the guideline for meals but i could never eat the bread. It is a trigger for me towards process foods something I am working on eliminating from eating period. I found if I eat one slice of bread and it then goes to a bagel or even a donut. I have research that whole wheat does not mean its good for u. I was wondering how could I get lower with the calorie count Ajima bc i really need to loose weight….u know like a jump start. I appreciate all your post and I read everyone. I like the clean eating process I always feel so much better without the process foods. But I relapse so I am starting over again. Any suggestions would really be appreciate. Thanking you in advance. Hi Fae, you can use romaine leaves instead of bread or tortilla wraps. I never suggest super low calorie plans for people who exercise. In the end people never intend to keep eating 1200-1300 calories for the rest of their lives. They may lose weight with low calorie plans…but they gain all the weight back when they stop “dieting”. I would also suggest that you check out the vegetarian plan and just add some meat to it. That might be a better fit calorie wise. All in all you can also remove the snacks to reduce some of the calories on this plan, but they are their so that you don’t get hungry between meals. Check out http://www.eatthismuch.com as well for other free plans. Oh how I wish you had a gluten free menu to follow. They are high in fat and carbs (ie. bread) . I think this is a good meal plan. Some of the thing that you have listed are not a part of my daily intake. Pork,beef I do not eat I understand to substitute for some other meat or beans. I would like to know if you are doing a September Challenge. I am a new comer and I am in my fifty’s. I would love to have a workout plan that will allow me to go to the gym. With the knowledge of what I should be doing to reach A weight loss goal of fifty pounds. I am 5″ and I weigh 180 and I need help. I would love it if I had a workout partner, but I know I can do this by my self. I’m not an exercise expert, but there are resources online that you could benefit from on YouTube and other exercise sites. I encourage you to do a search on Google for free exercise videos. Also, you may want to check out the Biggest Loser Workout DVDs. They are low impact. Hi Clara, I too am in my fifties and am working on my weight. I attend a Wellness Program at a local Convenient Health Care facility. The cost for the walking track unlimited use is $10.00 annually. There’s also daily exercise programs and water aerobics for a very small fee. You can chose what part of the program you desire to participate in. All of the activities are indoors in an air condition facility and only available for 50 and above age group. I love it. Check with the hospitals in your city Nutrition Dept., or the Physical Therapy Dept., and ask if they have a Wellness Program. Many have them for their patients with health issues to encourage them to stay healthy, but also allow the general public to take advantage of also. Good luck. Im really going to try September Challenge it look like a great start for me to lose weight. Wow, I absolutely love the simplicity of this. This seems tangible and I love the that the recipes, shopping list, and meal plans are all in one spot. So now that the eating part is covered, I just have to find a good workout plan that I can commit too. Thanks for the resources!! Absolutely awesome!! This is great! I agree Tylaiah, everything is right here for you. I like that the meals sound appetizing. Boredom spiced up!! I like to drink coffee every morning with about 2 teaspoon of sugar and cream. My question is how can I put this with the food plan? I like the food plan and this could really help me get started with working on my mental and weight. Is this a 1600 or 1800 calorie meal plan? Thanks! Hi Patricia, The meals on this plan are between 1600 and 1750. You’ll see the calorie counts noted with each day above. I would cut out the sugar, but on teaspoon is 16 calories we’re talking 32 calories so it’s up to you. You’ll need to note how many calories are in the cream you’re using as well. Coffee isn’t really a source of calories, but caffeine can affect water weight in some people and the liver has to work to filter it so there is a detoxing issue. I’d drink a lot of water during the rest of the day to counter that. Thank you so much for the meal plans. I intend to follow as best I can. I started my weight-loss/fitness journey in August and so far have lost 15 lbs. My problem is eating that many calories. I’m afraid of gaining weight instead of losing. I do workout on a daily basis, I will try my best. What can you substitute yogurt for in your eating plans and also is there any kind of cheese that is tasty and healthy. You can make vegan yogurt if you want to avoid the diary or just switch that meal with a different one. Hey there. What can I replace the roasted chickpeas with? This looks great but I’ve been counting calories & my budget only allows 1313. Can I go off if that and continue to move towards my weight loss goal? This plan is great! I can’t wait to start. I currently weigh 168 after losing 90lbs on my own, I need to get to my goal weight of 155 but my weight loss has stalled. I love the clean eating meal plan. I want to start eating clean and exercising to improve my health and also to loose weight. I recently had hip surgery and I have not been released to exercise yet. My starting weight is 273. If at all, how should I modify this meal plan and how will not exercising affect my results? Thank you. Hi Cami, First you have to determine what calorie goal works for you. If you aren’t working out, you don’t have that loss of calories to figure in. Based on your weight (I’d have to know some other factors to tell for certain), I would estimate your daily calories at 1400-1600 per day for weight loss, but it depends on how much you’ve been eating. Something like 1200-1300 could be too low and lead to over eating. Stay focused on REAL Food. No processed junk foods or fast foods. I’ve got a whole article about this for you http://www.blackweightlosssuccess.com/how-do-you-know-how-many-calories-you-need-to-lose-weight/ Also, You should check out the calculators on iifym.com and myfitnesspal.com. You can use the numbers they give you as a guide. I will start this Monday. It’s never to late. The plan looks good, I think if you’d just follow this healthy plan it would be good for the body. Hi, question about day 1: the recipe for the omlette calls for 4 eggs. Is that all for one person in one serving? I usually use 2 eggs for my omlette but never used 4 before. Yes, it’s for one person, but you can cut it down or just use the whites. Hello, quick question, I have a severe tree nut allergy (allergic to ALL nuts except peanuts) and have noticed that most “clean eating” meal plans include nuts. I’ve done research but have been unsuccessful in finding alternatives/ substitutes for the nuts. Do you know of any substitutes? What could I substitute for eggs and spicy chick peas? For simple dishes and left overs, 2-3 days is fine. However you want to consider how perishable the foods are. Some veggies may not keep well after cooking, but meats, rice, beans, etc last longer. What do you suggest for people that allergic to seafood? Would this weight loss be a good start for anyone with lupus? Prednisone keeps me with two to three extra pounds on. You would have to speak with your doctor about your nutritional needs to be sure. Wow!!!! Thanks for taking the time to do this!!! After I have my baby I will be trying this!!! I’ve been looking for something like this, I believe meal peeping will keep me grounded between my newborn, family, and school. I looked at your plan and I do like. The only problem I have with many of these diet plan it does not take into account different ethic Groups. Then your grocery list becomes expensive and if you have children it becomes triple expensive. I wish that there is some way to stream line these diet plans. I do know that the long term is to be healthy so i will try to tweak this plan as much as i can. Any meal plan is just an example. It’s no going to fit everyone’s lifestyle. I would encourage you to do some searching online. There are sites that have free meal plans for different ways of eating (vegan, Mediterranean, cooking for families) and specific needs like cooking healthy for a large family on a budget. You have to be the one to take various plans and advice and create a plan that works for you and your needs. That’s the only way to truly find something unique to you. Thanks for posting this meal plan. I’m going to give it a try. Reading all of these success stories are really pushing me to get back in shape. I will be one of those success stories this year. I appreciate what you ladies are doing on the website. I wanna give this a try, i seemed work bettet when i am folliwed a plan that tells me exactly what ti eat. My question is ,ate the 1serving so i should double everything for both me and the mr.? Thanks for sharing this. I love reafing the stories. Im a sorry for all that mispelling couldn’t see all i was typing. Will each week have a different meal plan? It’s a total of 4 weeks with different meals each week. I am allergic to peanuts and peanut butter. What can I use as a substitute for the recipes that call for those ingredients? This is awesome and very kind of you to take time and do this. Are you open for a more private meal planning? If not I completely understand. Yes, this is absolutely amazing what you did to create this. You rock! Thank you! This is awesome! I loathe cooking and most meal plans have these complicated (for me) recipes that I refuse to make. These are simple enough to make sense for work and home. Awesome! This is such an awesome resource! Thanks for creating this site. what to do if your allergic to nuts like almonds,pecans,walnuts,cashews..
What would be a good substitute for the fish in all of the meals? Links to recipes for the Breaded Baked Pork Chop, BBQ Stuffed Potatoes and 20 Minute Chicken Creole don’t work…what do you suggest? This is great!!! just what ive been needing an actual simple eating plan with a inexpensive grocery list. I substituted baked turkey wings for the pork chop is that ok? I look forward to my weight loss journey and im hoping to see results with this calorie intake amd I am working out 4 times a week burning a minimum of 300 calories. Hi Ajima. I found your site throught Pintrest. Thank you for the great information. I am a single mother with daughters ages 13(230 lbs), 15(285 lds), 17(215 lbs) and myself 39 (186lbs). Do you recommend this plan for my teens, or do you suggest something else. Help I really need my family and i to lose weight. Hi LaKecia, This is a straight forward plan for adults who are somewhat active. You may have to decrease the calories a bit for a teen, especially if the teen is not exercising…but I suggest some for of exercise 3-4 days a week. I would suggest speaking with their doctor about calorie counts before putting them on any diet plan or exercise regime. If you can speak with a local nutritionist, that would be great too. Until you are around 16-17 your body is still different from a grown up woman…so you have to be careful so that you don’t just start them on a yo yo diet cycle. They need a plan that will bring them to a healthy lifestyle. I also suggest you read “Eat to Live”. In week one I clicked the link to the chicken pasta salad but it directs to a site with many recipes and I’m unable to locate this particular one. Just wanted you to know. So I can come up with a recipe for that but my question is do you any good recipes or tips on cooking chicken so that it comes out moist and not chewy and dry? I’m struggling with this. I like to prep my meals and I LOVE you meal planner, seriously this is a blessing! I will be doubling the meals to include my husband and I work night shift so I really rely on prep work. Thanks in advance! I have this same problem with chicken….when reheated it is dry and tasteless. SOmeone recommended to me to reheat it with some water or broth but I have not tried it yet. I am allergic to fresh fruit, can I substitute canned fruit? Sure, just make sure it’s packed in water. I have a few issues food wise. I don’t eat scrambled eggs, omelettes, black eyed peas or pork, what can I substitute for that. Please create a meal plan for weight loss patient. Only that only have between 800 to 900 calories per day. Or please give samples. What kind of patient? Do you mean a weight loss surgery patient? If you are under the care of a doctor, your meal plan should come from them and/or a registered nutritionist. 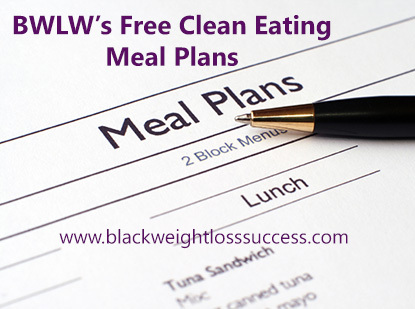 Sure, just send me an email at info@blackwomenlosingweight to confirm that you will note where the week of meals came from and provide a link to this website for more info. The link for the BBQ Chicken Stuffed Potato goes to an item that does not have the recipe. Can you please send me a link to the BBQ Chicken Stuffed Potato recipe please. Wow, it’s a blessing I found this site thanks for offering this for free. Most people are looking to make a few bucks but you are more concerned with giving us resources to get healthy and for that I am so very grateful. Can you recommend suggestions for foods? I know you say to alter it but I don’t quite know what suitable replacements are….for example I do not eat carrots, tomatoes, avocados, or celery :-/. What are some replacements for those? Also with the 1600 calorie diet…..how much should I be burning with each day of exercise? Some days I only do zumba or air yoga so I’m not burning as much as I would with a HIIT workout. Love this meal plan! Quick question. Week 1 Day 6 – the whole wheat french toast. Do we find a recipe to make on our own using WW bread? Thanks in advance!! Thank you soooo much Ajima! I can’t wait to start this eating plan on Monday! Thanks again for your help! Do you have any suggestions for a person like myself that has a peanut allergy(including almonds)? Are there any other alternatives? Thanks!!!!!!! what do you substitute for tree nuts? I am allergic to nuts, none of the diets ever make allowances for nut allergies. Hi my name is Jasmine. My fiance and I are trying to lose weight together, trying to better. My question is what can I substitute in for peanuts other nuts because I am highly allergic ? Hi Jasmine, It really depends on the recipe, but if you can have other nuts I would switch out peanuts for macademia nuts or cashews. I’m allergic to all nuts. Any suggestions for substitutes? Im going to try this as it is I just want to start eating clean and healthy thanks. I am allergic to bananas, melon and tree nuts. What should I substitute? For banana, I’d suggest mango instead. I don’t know a good sub for melon. For nuts, in recipes there isn’t a good sub. For snacking, I’d suggest you do raw fruits and veggies instead to get the fiber. You can also try dried seaweed. Anyway I can get these meal plans emailed to me with the shopping lists. Thankyou I truly appreciate it. Just discovered this website, as I was looking for a good detox, I am going to try the smoothie detox. I love your clean eating plans, I’ll let you know how I make out. Thanks again for posting all of this good information!! Can you eat day one all week? Sure, You can modify this plan as you wish to fulfill your needs. However, If you eat the exact same thing you should consider whether you are getting enough variety in terms of nutrients and vitamins. I was wondering would these meal plans work for a diabetic to help with the weight loss? Do you have more weeks? Yes, There are 4 weeks of the plan total. What can I use as a substitute for pork chops because I do not eat pork? Im up for the challenge. Should I eat everyday at the same time? Just a note, watermelon and strawberries are pretty much out of season, and if they are available would be somewhat pricey. Spinach, green beans…any green veggie. Hey!! This is just what I was looking for! I’m starting Monday but I have some questions… what is the coffee for? can I prepare the food for the whole week at once? can all the fruit be frozen? thank you so much!! I’ve only changed 2 days worth of information so far, so it’s basically the same plan. The Shopping list just hasn’t been updated. i just bought all the groceries for the previous plan. Are the two days you changed available anywhere. Today is day #1 and I am very excited about getting started. Where do I find substitutes for certain items on the meal plan….like celery for a snack. The only way I eat raw celery is with peanut butter or a ranch dressing. Also will you have a February challenge? Hi, We have a different challenge every month. Substitutions are up to you since this is just a sample plan meant to be an example. You have to change the plan for your needs and your desired amount of daily calories and nutrients (carbs, fats, vitamins, protein, fiber, sugar, etc). To make this as short as possible. I am a 65 year old black female. I am almost retired by the end of this year 2016. I weigh pass the 300lb weight mark. I feel the weight in my knees, I am border line diabetic. I really need and want some help to actually get started back on my weight lost regimen. I came across this website when I decided to see how black people get a check on losing the weight that they had gained. I use to be diligent in my weight loss, looking good, could have been a body builder. But something happened along the way to the age that I am now. Life’s mishaps I guess. But long story short, I want to get healthy again and look good for me. But, I have gotten so out in center field that I do not know how to get back. I love to workout but, certain exercises that I use to do..hurts! There are a few that still do not, and I try to stay on a steady workout schedule but, it never last long. As for eating, I had that under control also, but failed that too. I have tried different diets, only to lose faith in them after a while. I want give up the fight. I can’t walk very far because that hurts also. I just need a big push start. Got any suggestions..please? Hi; the shopping list is no longer available on week one, at least not from a mobile phone. We removed it. It was no longer accurate because we had to change some recipes. Where can I get the shopping list for the clean eating week 1? It’s not available at this time. my fiancé and I are looking to become more healthy and reach our body goals together. what could he substitute the nuts with?